Collecting Old Magazines | Magazine back issues and how to collect. Do You Collect Old Magazines? Here you will find tips on collecting old magazines woven directly into detailed original histories of select publications. As the site continues to grow (est. Sept. 2005) you can come to expect pages about collecting old magazines by theme, cover artists and art, vintage magazine ads and much more. This site features a detailed magazine grading guide, a resource page with links to various galleries of magazine cover images and checklists, and even a guide for both buyers and sellers telling how to best pack and ship your old magazines. Everybody reads magazines and everybody has their own areas of interest. It’s only natural that we would want to save back issues of copies that we especially enjoyed. Thankfully that’s human nature and that’s why there are so many old magazines available to us today. You may not consider yourself a collector, yet you may have a stack of back issues up on a shelf in your closet gathering dust. Guess what, you have yourself a collection. Collections can creep up on you in many different ways. My name is Cliff Aliperti and this is my site. I’ve been a collector (some say pack rat!) my entire life, starting with baseball cards as a kid and later as a business which I somehow turned into an online movie collectibles site and store. Old magazines have always seemed to be an important peripheral of any hobby I touched. 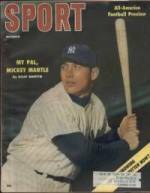 My two main areas of expertise especially lend themselves to the crossover, as what Mickey Mantle collection is complete without a run of Sport Magazine back issues from the 1950’s and 60’s? And how can you collect anything movie related without eventually bumping into an old copy of Photoplay, Movie Story, or another of the old movie magazines? The main purpose of this site is to examine some of my favorite vintage magazines in detail. I will provide a history of some of the more collectible publications and compose checklists whenever it is both relevant to the collector and possible to do so. I’m going to do my best to cover every area of collecting old magazines that I can think of…and then think of some more.